Since 1928 Muellermist Irrigation Company has provided residential homeowners with the highest quality in the lawn sprinkling industry. Design, Equipment, and Installation, three factors that today's homeowners should take into consideration when researching an irrigation system for their home. Muellermist Irrigation has gone to great lengths to ensure excellence in these three fields. 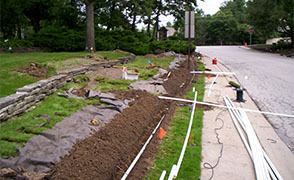 The first step to an irrigation system. A Muellermist sales representative comes to your home to discuss with you exactly what it is that you want your system to water. This ensures you will receive the proper quotation. We can even make suggestions on how to water specific turf or plant materials. 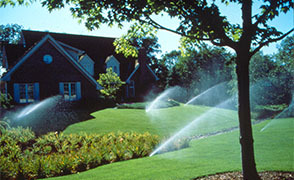 From this a plan is created which depicts a customized system for your watering needs. The representative will explain how your custom system will operate. All hydraulic piping and head locations are shown on the plan. All sales representatives are trained personally by leaders in the irrigation industry, and are qualified to design any shape or size irrigation system. Sprinkler design is crucial, but it must be coupled with quality. To uphold the Muellermist standard. Muellermist has done an incredible amount of installation, in fact we have over 10,000 systems installed to date in the Chicago land area. About 2000 of these systems are commercial properties. Sometimes we are required to install a wide variety of equipment. This hands on education allows us to choose not only the highest quality, but the most truly functional equipment for your home. 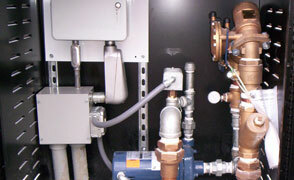 You receive the same high quality equipment that we install at multi-million dollar commercial properties. The true implementation of both design, and equipment. Muellermist employs only trained personnel to install it's landscape irrigation systems. Installation crew leaders are just that, leaders among men who work hard to uphold our set standard of quality. Leaders who are qualified and confident to make quick decisions when a particular unforeseen problem arises. Capable, dependable installation crews are the backbone of any construction company, that's why Muellermist is so successful. If you are interested in obtaining a quote for your Muellermist irrigation system, feel free to call us and schedule an appointment. We at Muellermist feel quite confident that upon review of our bid packet and plan, you as the homeowner can rest assured that you have chosen the highest quality, most comprehensive landscape irrigation system available.